In approximately four days we’re flying home to Oregon for a two week break filled with family, friends, Mexican food, microbrews, a functioning government, a separation of church and state, infrastructure, public transportation that works, recycling, libraries, clean parks, hummus, a 15 minute commute to anywhere… And a wedding!!! And naturally, like every time I prepare for a long vacation, I drain our food supply to nothing so we don’t waste it. We are surviving on vegetarian stir-frys at this point, so I finally gave in and asked my pembantu to pick up some fruit to snack on between stir-frys for the next couple of days. I came home to a papaya and a guava. 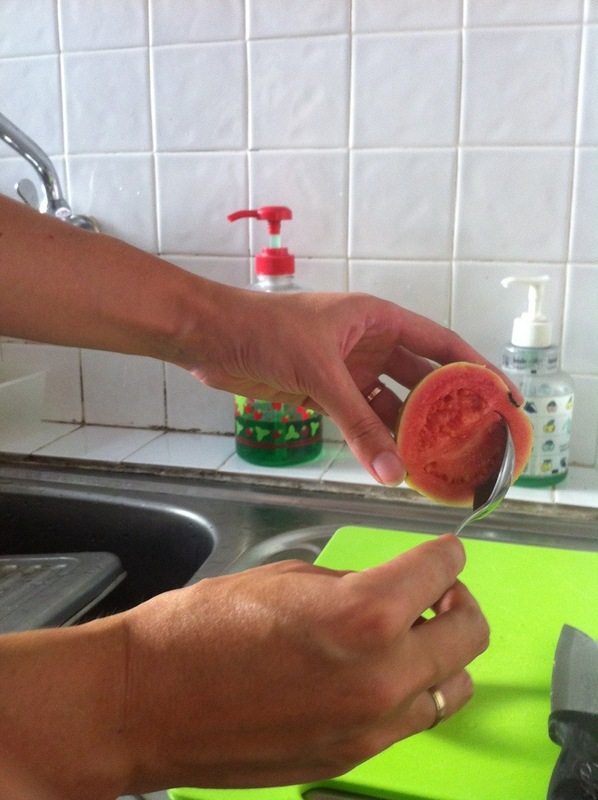 I’ll show you what to do with a papaya next time… But right now I’d like to talk about the guava. Guavas aren’t the most convenient fruit to eat and usually are just found in juices or as a flavoring. 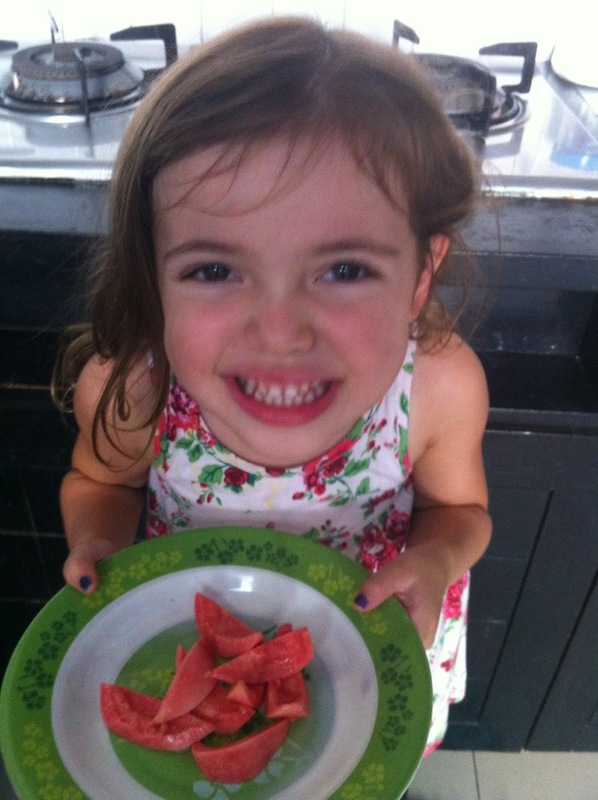 But Ellie loves them raw, so I cut it up for her. 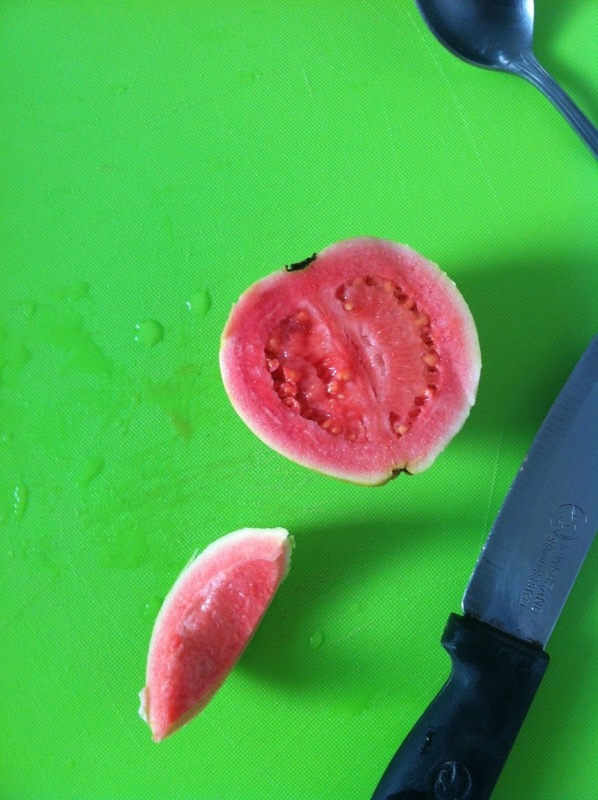 Like a lot of fruit, the guava has inedible skin and seeds in the middle. So I start by cutting it in half, scoop out the guts, and then fillet the flesh from the rind. I might be really late to the game, but this whole using technology in the classroom thing is pretty amazing. I’ve tried several applications and websites throughout my BA and M.Ed programs; be it forums, wikis, or other social media platforms that were popular at the time. But I have to say Edmodo is by far my favorite site for the classroom. Minimal set up and maximum output is my kind of tool. And how do the students like it? I asked my seniors if they’re familiar with Edmodo because I created a group for our class and I wanted them to join. Do they need me to hold their hand through the process? One student reassures me, “No Miss Jenny, it’s easy, it’s like Twitter.” “Yeah for homework” blurts out another student. And the class laughed. I had already posted the assignment with links for research ideas and within minutes, all 20 students had joined my group and started researching their topics. No paper. No hassle. And on Friday, when the assignment is due, all my students will need to do is copy and paste their summaries and links to our group, letting me track progress and time stamp each post. Homework will include commenting on other’s posts. 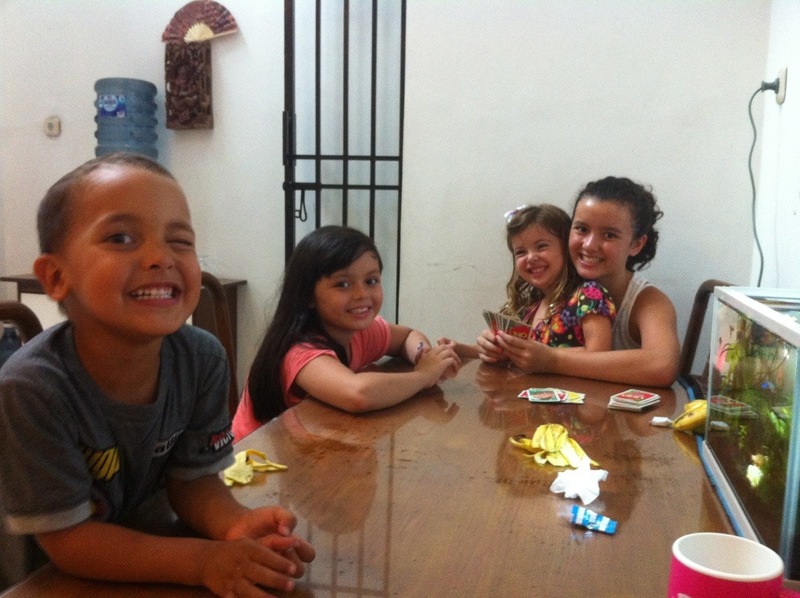 I have another group for my ESL class that I plan to introduce today. I’m hoping to use this like a toolbox with supplementary assignments for the fast workers, like an additional angle to what we’re all working towards. And did I mention the file library, google drive connection, or quiz and polling features?! Love. E: I have a new religion teacher. Me: Oh? Is she nice? E: Yeah. It’s just me and her. Me: There are no other kids in your Hindu class? Me: Well, what did you guys talk about? E: God. He’s a giant. E: Yeah, with claws. And if you’re mean he’ll scratch you. So you have to be nice. E: I’m afraid of giants. Me: Some people think he is. Some people think God made the sky and earth. But some people think nature made the sky and earth. What do you think? E: I think earth made earth. What about dinosaurs? Me: They were alive a long time ago, like before Grandma and Grandpa and even Saba and Savta! Now we can only find their bones. E: What happened to the dinosaurs? Me: Nature. There was a lot of ice and volcanos and fire and lava and they died. People dig up dinosaurs and are trying to learn what happened. I seem to have overloaded a bit on extracurriculars! I’m hoping this will help me keep busy and stay positive this year. I’m teaching newspaper and debate club each once a week. I’ll finally start taking Bahasa Indonesian language classes twice a week. And I kind of fell into joining a teacher softball league that plays on Fridays. 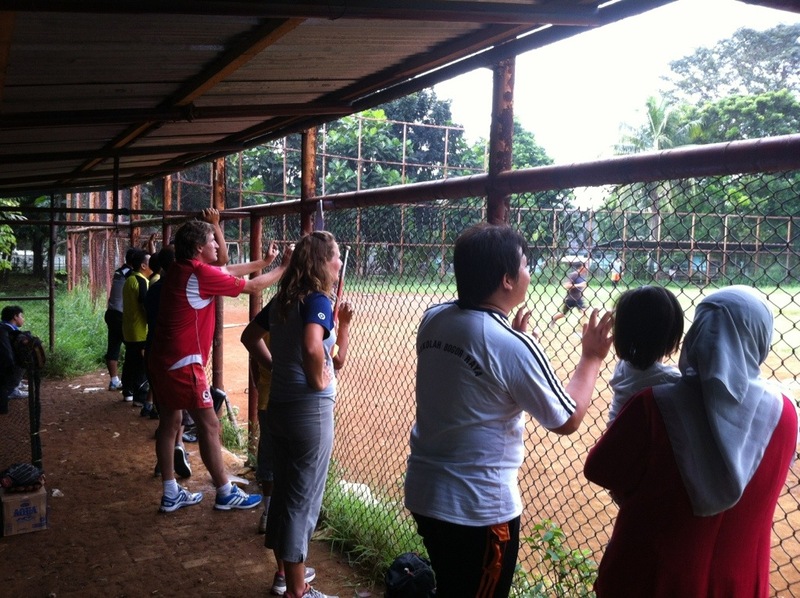 Today we played against the best team in Bogor… and lost. 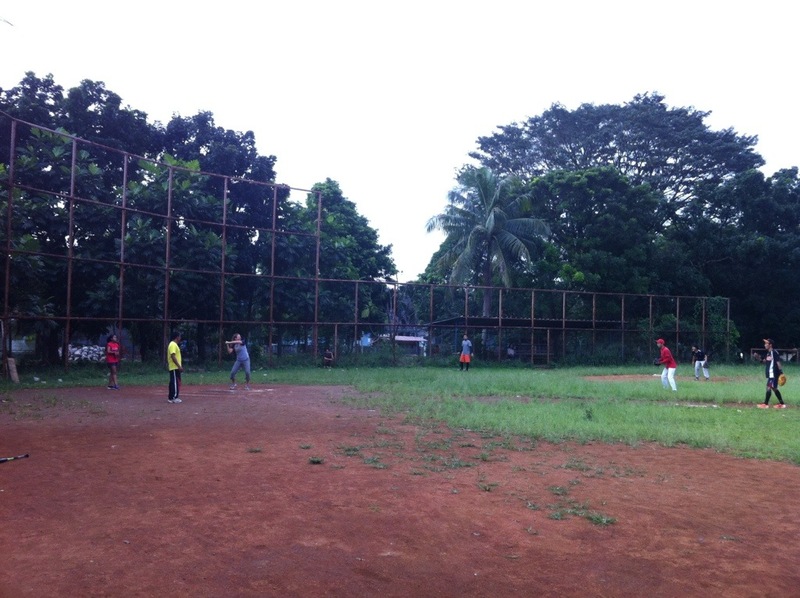 But I hit the ball and got a run! Not bad for my first softball game. Ever. I thought I was culturally sensitive. I thought I was adaptable. I thought I was some kind of international explorer willing to experience the biggest challenges with a triumphant smirk and flick of the hair. And I say this because I’ve now realized that I can only be those things in very small doses. It’s when I have to be all of the above at the same time while trying to get ready for work or wash my dishes without running water, cook without power, listen to shouting on a loud speaker at 4:00am for people to wake up and eat, or if I hear habis (meaning empty) one more time when I try to buy something I may just scream. But I can’t. Because you don’t scream here. And you really don’t scream during Ramadan. 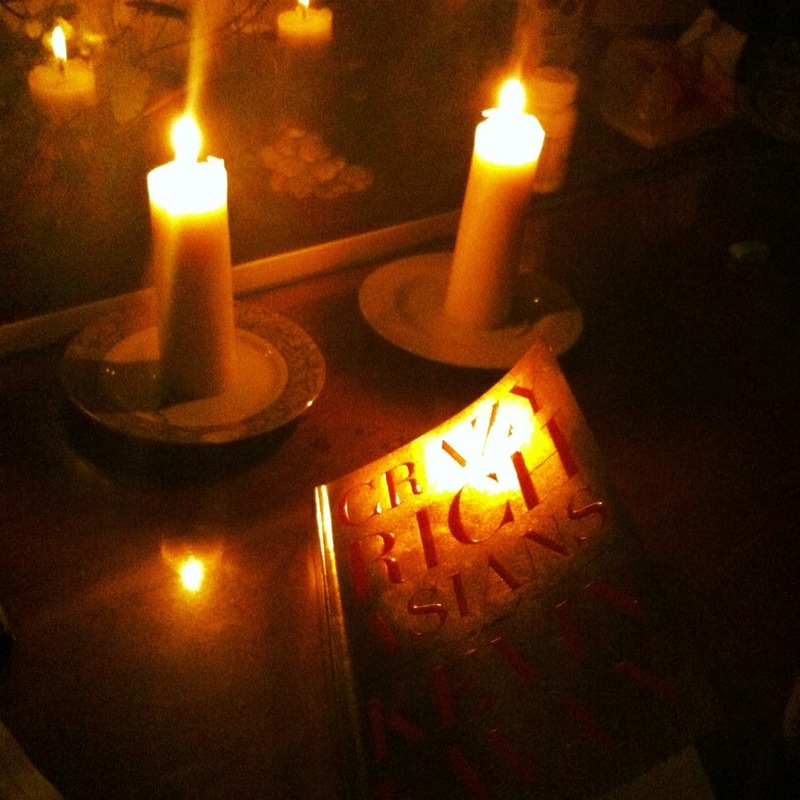 And… If I can’t scream, then I’m just going to bury my head in a book (this one in case you were wondering) and focus on keeping my family afloat for 3 more weeks. Cause in 3 weeks I think I may just have to scream with joy the second I land on American soil. And that, my friends, is what I find the most shocking of all. 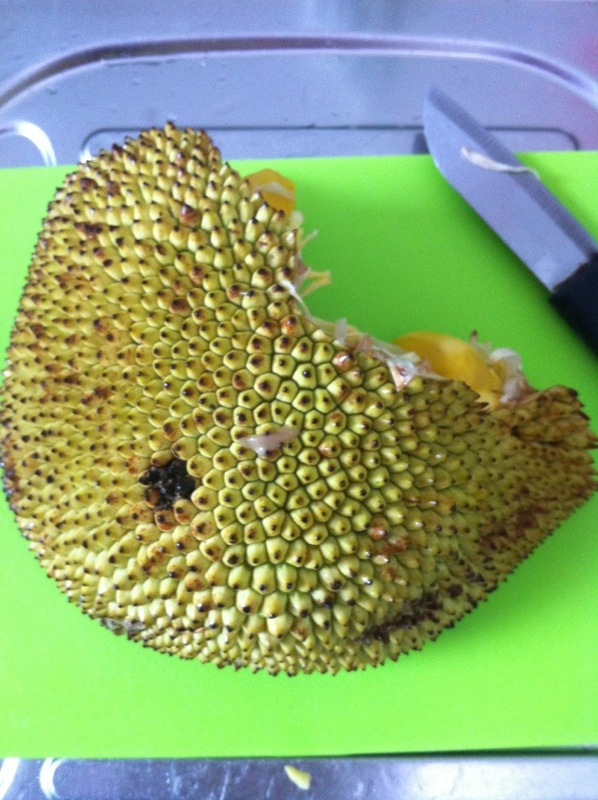 We’ve talked about mangosteen, rambutan, and mangos before… Now let’s talk jackfruit! Jackfruit is a very strange looking but tasty fruit. It seems to grow pretty wild in Indonesia (though I remember seeing them all over the place in Thailand too), making trees look like they have large, spiky, cancerous growths hanging from them. But thankfully someone had the guts to open one of these and discover the delicious yellow pods inside. Don’t mistake these for durians, which are also spiky on the outside. 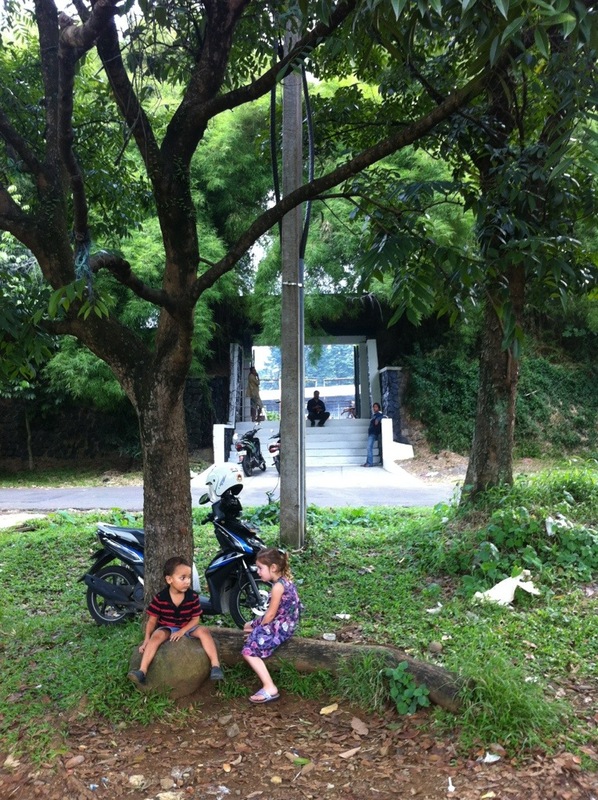 The durian fruit is really stinky, banned in many public places, and tastes very distinct (Death and dirty socks? Yum!). 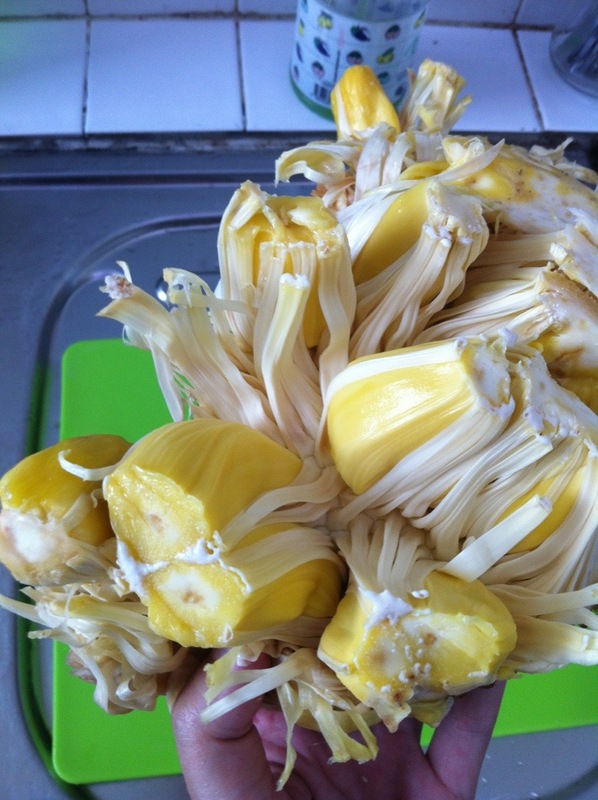 Jackfruit on the other hand has an interesting flavor, familiar, but unique. Maybe a cross between a pineapple and mango? 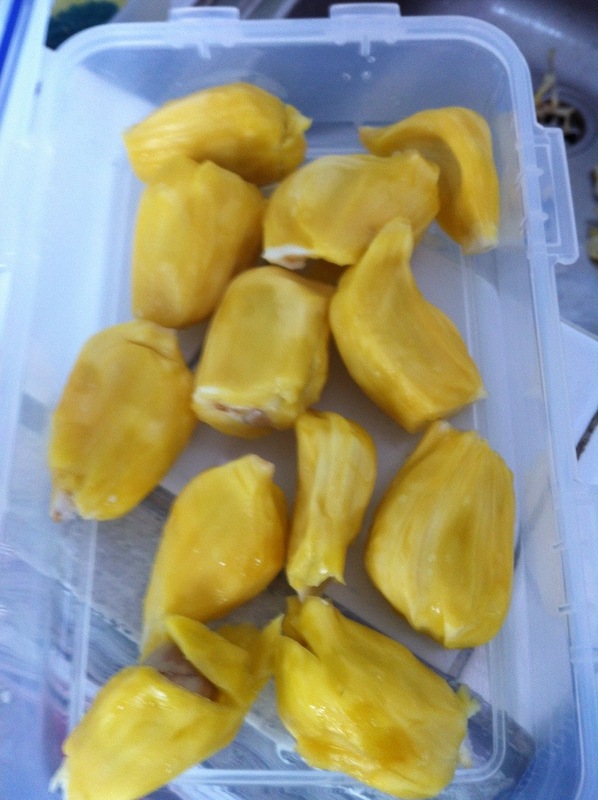 I had been craving jackfruit for over a month and haven’t been able to find it in any stores. So yesterday at the traditional market I bought a quarter of one for a dollar. Today I cracked into it and started carving out the pods. 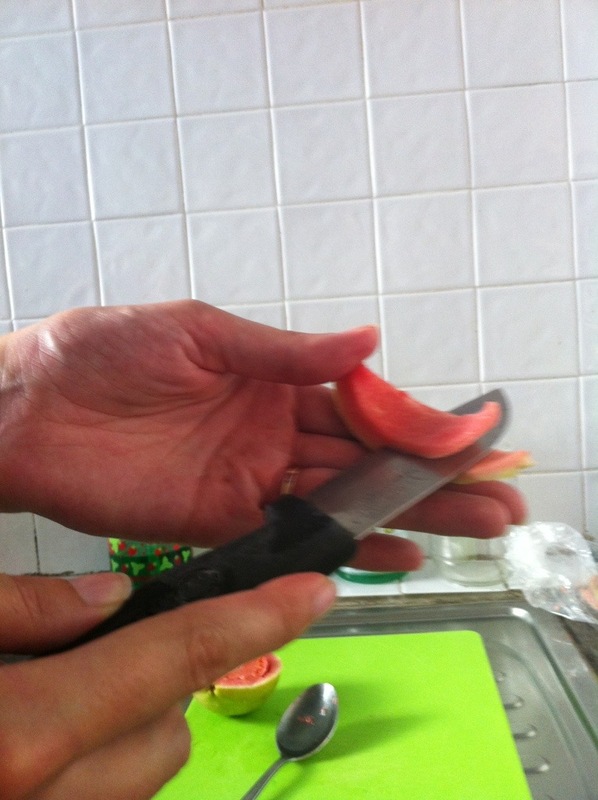 Tips: Use a sharp knife and pre-coat your fingers in oil to prevent the inner peals from sticking all over you. The stickiness doesn’t wash off with soap and water! (Picture me turning to my pembantu this afternoon, hands sticky to high hell shouting “help me!! !” And her laughing.) Once you remove and wash the pods, you can eat the fruit. Discard the pits as you go. 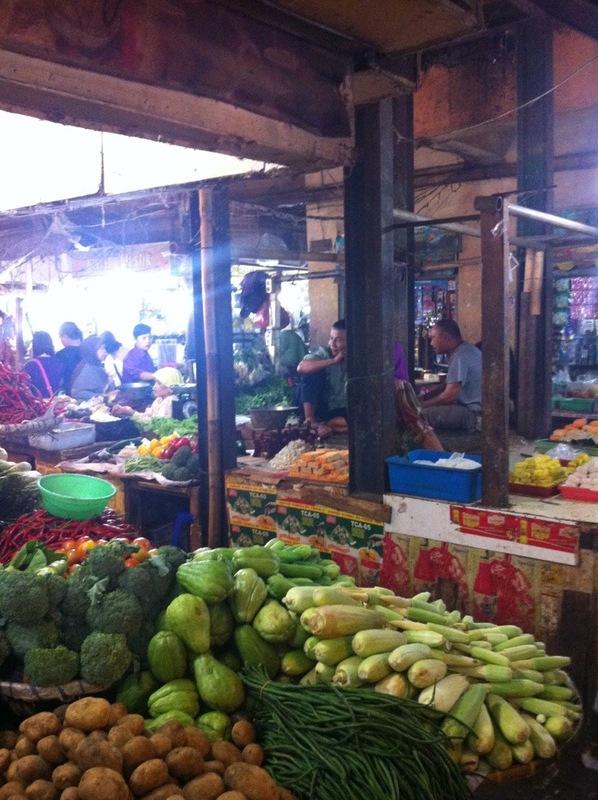 I wanted to write a reflective piece on the year we’ve spent in Indonesia. But the more I thought about it, the more I realized that I wasn’t interested in that year. I’m far more interested in this year. Now don’t get me wrong, this past year has been one amazing, albeit challenging year for our family. But I really do think that all that hard work will pay off. We now have a car (Seth can fill you in with the details later on), a trip home next month to celebrate a family wedding, a savings plan, excellent professional opportunities and development, and new expat friends in the neighborhood. Things are looking up in this part of the world. What’s next? We plan to enjoy the fruits of our labor for the next six months, and then we’ll need to make a decision. Stay? Go home? Whatever it will be; it will be extraordinary.